Lip-smacking barbecue and scenic views make for a winning combination. What’s better than fall-off-the-bone barbecue? How about a glorious view to go along with it? At The County Line, you’ll be treated to both. And, there are two beautiful Austin locations to choose from. The County Line was established in 1975 by owners Skeeter Miller and Ed Norton, two proud Texans and barbecue enthusiasts. Their first location, The County Line on the Hill, is located in a historic speakeasy and was the inspiration behind the restaurant’s reputation for stunning views. 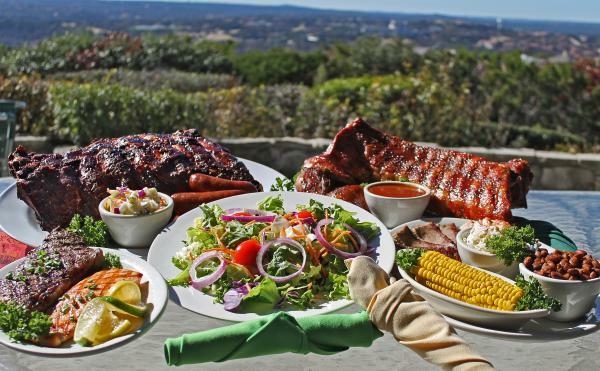 Here diners can chow down on slow-smoked slabs of ribs and lean brisket while perched on a patio with a breathtaking 20-mile view of beautiful Texas Hill Country (and incredible sunsets!). At their second Austin-area location, The County Line on the Lake, the restaurateurs converted a former lake lodge that’s situated right on Bull Creek, just off Lake Austin. Diners enjoy the panoramic water view from a large redwood deck as they sip cocktails and dig into specialties like spicy German sausage. In establishing their restaurant, the founders of The County Line pledged to offer the highest quality of barbecue (including ribs, brisket, sausage and chicken), along with traditional sides like cole slaw, potato salad and beans. Their barbecue specialties are served up in generous portions at reasonable prices, paired with friendly table service. It was also important that their locations were authentic and celebrated the heritage of Texas. All restaurants are big enough to easily host large groups of barbecue lovers. Today, the iconic County Line has locations all over the Southwest, including San Antonio, El Paso and Albuquerque, New Mexico. And for fans further afield, The County Line ships its legendary barbecue across the country via Air Ribs.